In some ways, the subwoofer cable interconnect is the least demanding application in home theater. 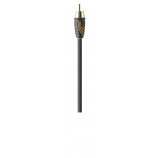 While HD video demands cables able to carry high-bandwidth signals, at tight impedance tolerances, the subwoofer cable has the relatively easy job of carrying a very low-frequency, very low-bandwidth signal. But a subwoofer cable has a critical job to do, and needs to do it well: keep out hum. Hum can come from ground loops , often, from EMI (electro-magnetic interference). High-energy, low-frequency noise, like the 60-cycle hum from nearby power cords, fluorescent lights, and other miscellaneous sources, is the hardest type of interference to shield against, and the best defense here is a dense and highly-conductive braid shield. The mutli-award winning Performance category, renowned for extraordinary performance at exceptional value presents Performance Subwoofer. 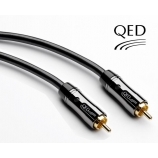 The QED Performance Subwoofer Cable offers a very high level of screening when compared to normal line-level interconnects, this is vital in ensuring that AC mains hum is absent from this delicate signal.